As Pakistan’s power-brokers consider who will be their new leader, former president Pervez Musharraf appears to be taking things in his stride. Mr Musharraf’s aide Tariq Azim says the former president, who was forced out of office this week, has dismissed media reports he is about to leave Pakistan. Instead he has been relaxing, playing tennis and spending time with his family, especially his mother. Mr Azim says Mr Musharraf was in a jovial mood when the aide saw him on Tuesday and mentioned he would like to write a follow-up book to his 2006 memoir In The Line Of Fire. Pakistan’s new president is expected to be named within 30 days but the ruling coalition leaders are yet to resolve an impasse over whether to reinstate judges sacked by Mr Musharraf. The ruling coalition in Pakistan is led by the parties of slain former premier Benazir Butto and ex-prime minister Nawaz Sharif. The parties showed unity in filing the impeachment charges against Mr Musharraf which resulted in his resignation, but since then they have been unable to agree on a successor or whether to reinstate the judges he sacked. Mr Sharif wants the judiciary restored immediately but talks have ended without agreement and will start again on Friday. 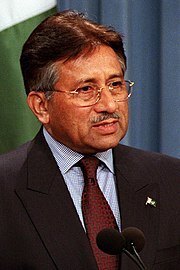 On 18 August President Musharraf abdicated his second seat also with wet eyes. Removal of his second skin was really painful for him but he had to ultimately vacate his chair of COAS with a heavy heart in November last under pressure exerted by lawyers movement. He had however hoped to retain president’s seat for the next five years on the basis of having won controversial presidential election on 6 October 2007, and then getting it validated through PCO Supreme Court and rubber stamp national assembly few days before the expiry of its five-year tenure. He had assured his King’s Party and the MQM that he would ensure their return to power in the next elections. His patron in Washington who had scripted the new game plan of power sharing with Benazir Bhutto had also lent him his full support. His declaration of emergency on 3 November, sacking of 60 judges of superior court and removal of uniform failed to quell the tide generated by lawyers, civil society, and political parties. On the contrary demand for restoration of deposed judges kept mounting and his popularity graph continued to dip with every passing day. Benazir Bhutto’s murder on 27 December, added to his woes and he as well as Choudhry brothers were seen with suspicious eyes. King’s Party was named as Qatal League by the PPP. He had placed all his hopes in the 18 February elections under the hope that he will be able to once again rig election results as he had done in 2002. However, the army under new chief Gen Kayani refused to play his game and got distanced from politics. As a consequence, polls results went heavily in favour of PPP and PML-N. PML-Q including some of its leading stars was demolished. Having failed in his plan to put his dream team in power, he then began to hatch conspiracies to sap the coalition of PPP-PML-N. He and his toadies had given a three-month life span to the ruling coalition. Somehow, the leading coalition partners continued to sail together despite Zardari’s ambivalence which caused frustration to the team of conspirators. He turned a deaf ear to loud calls for his graceful exit and kept dreaming that the tide might change in his favour. His secret understanding with Zardari, levers of NRO and Article 58 (2) (b) he held, support of King’s Party and MQM and assurances by his foreign mentors and surging differences between Nawaz and Zardari on judges issue kept his hopes alive. Each time a deadline was given by Nawaz to restore judges and Zardari dithered, it bolstered the spirits of beleaguered Musharraf and his cronies but soon after their spirits deflated. Unhappy with Kayani, he tried to swap him over with CJSC, but Kayani pre-empted and quickly changed the 111 Brigade Commander. With the coming in power of PPP led government, the people had hoped for a positive change. Contrary to their expectations life became more difficult because of flour shortage, load shedding, spiralling prices of daily commodities, gas, fuel and electricity. Apart from all economic indicators nose-diving, growing political instability because of PPP’s doublespeak and lack of sincerity and deteriorating internal and external security situation added to the frustration and disappointment of the people. The major issue of judges remained unresolved. Amidst the rising tide of despair, Zardari who had come into the limelight after Benazir Bhutto’s death and had in a short span of time earned admiration and respectability began to lose his sense of direction. More he dawdled on judges’ issue more unpopular he became. NRO became his Achilles heel which made him play tricks to buy time at the cost of his reputation and credibility. There were rumblings within the PPP itself which did not bode well for the future of the party. Both Musharraf and Zardari were termed as problems and not part of the solution. Zardari woke up from his slumber when Musharraf began to become assertive and his aides hinted of dissolving assemblies, or imposing governor rule in Sindh, or revocation of NRO. On 7 August he and Nawaz raised the flag of impeachment. Soon after, all the four federating assemblies passed resolutions asking Musharraf to seek vote of confidence or quit. When the noose of impeachment began to tighten around his neck and the attitude of his chief patron and the army chief became lukewarm, he realised that he should save his skin before it is too late. While putting up a brave face, he started making concerted efforts to save himself from impeachment and trial, extract indemnification of all his crimes and a safe-exit. Till the last minute in his office, he and his confidants kept bluffing that he would not resign and that he would fight it out like a good commando. Abdul Hafeez Pirzada kept feeding him that he could not be impeached and he had strong legal grounds to disprove the charges framed against him. All this time, his foreign well-wishers pressed Zardari and Nawaz not to impeach him and allow him safe exit. Having wriggled out of the stranglehold of impeachment and trial he tendered his resignation. While delivering his farewell speech in which he vainly tried to blow his own trumpets, he must have thought how quickly happy times had ended. On 12 October 1999, when Nawaz Sharif government was deposed by a team of adventurers led by Gen Musharraf, there were rejoicing on the streets and the opposition parties had distributed sweets. His period of glory faded away into oblivion and history repeated itself after a lapse of nine years. When Musharraf threw in his towel after digging his heels for six months, people rejoiced once again and distributed sweets and resorted to aerial firing and firecrackers to celebrate his departure. The nation never witnessed such wild jubilations on the ouster of a despot. From among the four military dictators that had usurped power, only field Marshal Ayub Khan and Gen retired Pervez Musharraf had the pleasure of delivering farewell speeches to the nation. Former stayed in power for ten years; the latter ruled the roost for about nine years. While Ayub had said that he would not like to preside over the break up of Pakistan, which proved prophetic, Musharraf warned of dangerous times for Pakistan. Ayub handed over power to his C-in-C Gen Yahya Khan instead of the Speaker of the Assembly as provided for in the 1962 Constitution. But Musharraf followed the legal path and handed over the baton to Senate Chairman. Had Gen Tariq Majid been in COAS chair, his responses could have been different. There was no demand for trial of Ayub and he lived peacefully in his Islamabad house till his death. In case of Musharraf, except for his beneficiaries, the rest sought his impeachment and trial. Gen Yahya Khan was forced to abdicate power by Lt Gen Gul Hasan and Air Marshal Rahim. Once he resigned and handed over power to ZA Bhutto on 20 December 1971, he was placed under house arrest. He was advised by Bhutto that it was in his interest to spend the rest of his life inside his house otherwise, he would not be able to save him from getting lynched by the emotionally charged people. He went through the trial conducted by Hamoodur Rehman Commission which was held in camera and the Commission held him responsible for the break up of country. The Supreme Court also declared his take over in March 1969 and declaration of martial law illegal. His wish for open trial so that he could prove himself not guilty of the charges levied against him was not ceded to by Bhutto. Musharraf on the other hand did not pickup courage to face the charges levied against him and prove his innocence in the court of law. Nature took away Gen Ziaul Haq and his companions on 17 August 1988 in a mysterious C-130 crash, near Empress Bridge Bahawalpur. It is widely suspected that foreign agencies had a definite hand in the crash of safest aircraft in the world. But for the fatal air crash, he would have continued to remain in power for some more time since he faced no political threat. Still, he had the longest inning of eleven years. He was buried at a picturesque sight near Faisal mosque Islamabad and tens of thousands of his fans both from Pakistan and Afghanistan attended his funeral. They mourned his death and considered it a great loss for Muslim world. Musharraf wished for beating Zia’s record and would have broken it had he been allowed to complete his five-year tenure finishing in November 2012. The army was demonised by our adversaries during Yahya and Musharraf tenures. The army was used by Yahya against the rebellious Bengalis led by Mujibur Rehman on 25 March 1971, to quell an Indian sponsored rebellion. Under a well orchestrated propaganda campaign the Indo-western-Jewish media painted the army as human eaters and rapists to defame it and facilitate Indian sinister plan to dismember Pakistan. Half of battle was won on the psychological plane before the military instrument was applied. Yahya had used the army to save Pakistan from splintering and had maintained an aggressive posture against Indian machinations. Once again the same band complemented by US media has brought the army in its firing line. This time, Musharraf helped our adversaries in their evil designs by pushing the army into the cauldron of FATA at the behest of USA and making it fight against patriotic tribals who have a rich history of defending the western border against foreign threats. Gen Ziaul Haq had used them to keep the Afghan war beyond the Durand Line without any assistance from the army. While Zia too had made lot many enemies inside and outside the country, (RAW, KHAD, KGB, Al-Zulfiqar, PPP and later on CIA), Musharraf earned the undying enmity of Al-Qaeda and religious groups. He survived seven attempts on his life and he is still being hounded by them. Since Al-Qaeda has attained a long arm that can reach almost every where in the world, other countries are reluctant to provide him shelter. His wish for leading a quiet retired life in his mansion in Chak Shehzad may not get fulfilled because of security fears. Other than Musharraf, no other military leader became the blue-eyed of USA, UK, Israel and India. These countries have traditionally pursued anti-Pakistan policies and have all along tried to exploit our leaders to harm Pakistan. The way Musharraf went out of the way to promote US agenda and to appease India was much beyond their expectations. Except for Musharraf no other leader had dared to get closer with Israel. But for judicial crisis, he was well on his way to restore diplomatic relations with Tel Aviv. The four are the saddest on his departure and are looking forward to remain in touch with him once he settles down abroad. Having earned the repute of an American stooge and his insatiable greed to stick to power, he has faced more humiliation and disgrace than other three military rulers. Having been left high and dry by even by his closest friends, Musharraf suffering from megalomania has been consigned to dustbin of history. His era has finally come to an abrupt end and once he leaves, there will be no farewells and no tears shed. Whatever days he spends in Pakistan would be fraught with tension and danger. The lawyers and deposed judges in particular as well as all those who have suffered a great deal at his hands have breathed a sigh of relief. The lawyers must be feeling happy that their one and half year struggle has ultimately been crowned with success and they are hoping that the brave and upright judges would be restored promptly and honoured. Nawaz must be brimming with joy for having avenged his humiliation. Now that the chief obstacle has been put aside, the political leadership will have no more excuses to lump failures in Musharraf’s kitty. It should quickly brace itself to the challenges confronting the nation. Asif Haroon Raja is a retired Brig based in Rawalpindi and a defence and political analyst.